Do you have a designer page on ravelry.com? I love this so very hard. Thanks for sharing the chart as well! I LOVE IT SOOOOOOO MUCH…and I’ll make it for my son too…thank you so much for sharing!!!!!!! I really liked your skull pattern though I haven’t worked mumuch and I’ve only done (and just finished) a scarf. I really wish I could learn there’s patterns and do this sweater for myself or a friend of mine. Do you make tutorial videos or know someone who does for this pattern? I’m not going to make a tutorial for this cable item and sell it later (as this is a lot of work and understandably can’t be offered for free) – I prefer crocheting and selling crochet patterns. Starting from the fact that I was noticing that your son is very gorgeous (how old is he?) I really appreciate the fact that you gave me so many links from where I could start and practice. Sadly I will not start right away because I help an association who helps premature children and we knit for these newborn babies because they are too small to fit in the normal dresses. As soon as hospital won’t need us for a while I’ll start practicing! BTW thanks for giving me a ravelry link because I just signed up and I find it fantastic to search new patterns! Thank you, Giulia, he’s almost 18 (and loved your comment very much :))). Your help in the hospital is very important and I’m sure very appreciated. Children need clothes made with love. Wish you good luck with all efforts! Thanks for the replies, say hi to your son! Sorry if this is a duplicate message from your fb page….Thought I’d try contacting you this way! Hi Shelley, indeed I rarely visit FB page :). I think you can take thinner needles and yarn for your daughter’s pullover. I’ve noted the amount of sts in the first row for the mentioned size (front and back). 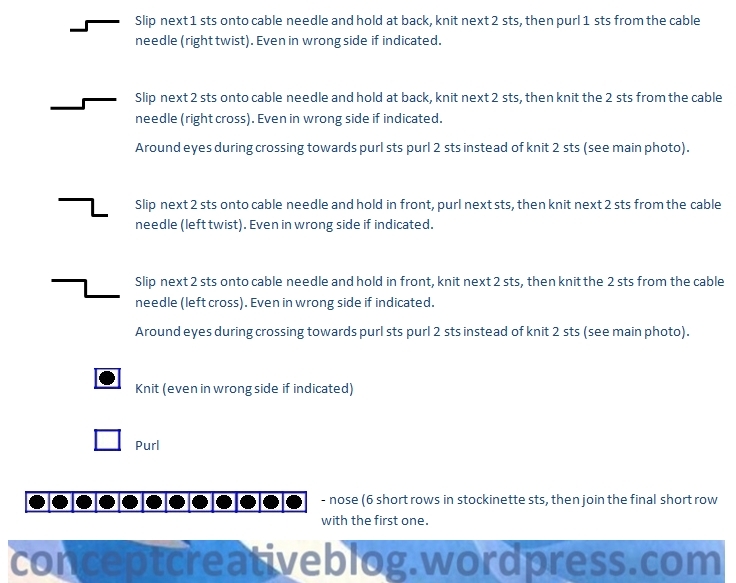 After completing gauge you will see how many purl stitches to work at the edges in your version (maybe you’ll need to decrease them as well). Count the height of the gauge rows to see whether the diagram of the skull ends where necessary (under her neck) and where you will start raglan decreases. I admit that my first completed 2/3 of the skull was small and raglan sleeves had to be started earlier than I wanted, so I’ve redone front completely. In sleeves I had to undo a couple of rows too. Everybody has to improvise :)). I have knitted back by looking at the original, without charting patterns. But since many people in ravelry wanted to have suggestions for the back I’ve found free waffles pattern in Drops – please read my reply http://www.ravelry.com/discuss/patterns/3047097/26-50#38 . As for the cables along the skull – they are made over 10 sts: 1 purl, 8 knit, 1 purl in the first row, then you gradually cross stitches over next 8 rows to form round chain (my chains are done over 10 rows otherwise I’d had too many of them). Yes, stitches on the wrong side should be mostly worked as you see them, except for the pattern in the eyes – they are purl sts on the WS. In some rows (beard, forehead) I have crossed stitches on the WS too. If you cross them on the right side only the beard and forehead would form triangles. Well, my chart does not copy the original skull completely because I had to adjust front for the bigger size and chosen yarn, but I’ve noted all changes in ravelry so it is possible to knit the original pullover. thank you, Inna! I only mentioned this because I was following the chart at the beginning, so the empty squares looks all like ‘purls’ – I swatched it last night so today I’ll be casting on (I’m a size S/m , so I will most likely have to change some more) thank you again, this is a massive amount of work! HI! thank you so much for the pattern! Since it’s a raglan sweater, did you begin from the neck down? and what stitch is the next to the skull? Is the sweater knited in a round or front side and back side?